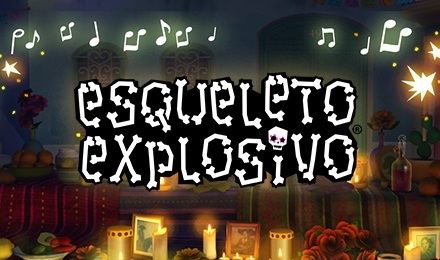 With a 96% RTP, mucho multipliers, dropping reel symbols, a fun theme and more, Esqueleto Explosivo Slots is irresistible! Login and start spinning today! Olé! Take a trip to Mexico from the comfort of your home when you play Esqueleto Explosivo Slots. The reels are made up of 5 skeletons with 3 skulls stacked on each. They play instruments and start singing when you get a winning line. There are loads of multipliers, the Pink Skull with the Rose, being the highest multiplying symbol in the game. Grab your sombrero and play Esqueleto Explosivo Slots today!